Every year, the company where I work holds a health fair. They set up in the break room/kitchen area and they then draw blood to check for cholesterol levels and other diseases and they administer flu shots. All for free. This year, I tried really hard to psych myself into going up there and joining the bloody party. I thought I should at least get a flu shot, I mean, everyone else was getting one..then I realized, if everyone else in the world gets a flu shot, I wont have to! Kidding aside, I couldn’t bring myself to do it. I do what I can to stay healthy all year round, and during the Winter, I take my chances by passing up the flu shot but I pound Vitamin C drops, drink hot cider and generally up my hand-washing frequency to an unfathomable amount and I do OK. In the end it’s a gamble and I get the flu every couple years, but for the most part, it’s mild and I survive. After our Thanksgiving hoopla with both sides of the family, everything seemed just grand. We got home safely and were happy to be back, sleeping in the comfort of our own beds but that night we got a rude awakening. Our three year old daughter came into our room which happens occasionally (she has the worst night terrors…of giant ants eating us and monsters shrinking us, real vivid freaky stuff…but that’s a tale for another time). I just assumed she had another nightmare and was about to lift her into bed when I heard that sound that can wake you from the deepest sleep…and the next thing I knew, I was covered in throw-up, at 4am. There must have been something in that second Thanksgiving dinner we eat because the rest of my immediate family excluded, about 2/3 of the 65 people that attended that big dinner on Friday night were sick to their stomachs. Like any vomit story would, this got me thinking about the flu and what that flu shot or lack thereof was costing me each year? If this in fact was the flu that my daughter had contracted (it seems unlikely at this time) I would surely have it now and would be heading into rough territory. On average when I get the flu, I am unable to go to work for two or three days. As an hourly employee, that’s 1/5th of my weekly pay. If in the last 5 years, I passed up the flu shot and got the flu two out of the five years, that’s an entire week of work missed. I use up my vacation/sick pay pretty early on each year as my parents always plan some big, week long, extravaganza. We really enjoy vacation and traveling and would love to do more of it but it seems as long as I keep passing up my free yearly flu shot, I won’t be taking any extra vacation time. I take a free flu shot if it is available even though (1) I get the flu only every ten years or so (knocking very hard on very hard wood) and (2) I don’t like needles, either. When I give blood or when the doctor needs to take a blood sample, I need to lay down if I don’t want to pass out. Very weird because there is no pain, it’s just…..I wish I knew what the problem was. ctreit, I wish I knew too. It’s all in my head, and if I actually need to have a shot or get my blood drawn, it’s no problem. But if I don’t absolutely need it, I can’t force myself to do it by any means. My husband’s workplace dispenses free flu shots, and he is the only one who doesn’t take them. I did buy face masks last year to protect us from people who take those shots, because at least at his workplace, those who take the shots seem to get sick within 10 days or so. Then they pass it on to others. Neither of us has had the flu, but I am not sure we would recognize it as such if we did. It seems a vague term to me, and the vaccine is specific. In any event, I have no confidence in the vaccine as being protective, and think it is more likely to do harm. Some things I don’t want even if they are free. Flu shots are so highly promoted, even to the extent of being given away, that I can’t help but think that maybe that is because they will cause the target to need medical care after that great gift. Yana, You aren’t the only one that believes these may be spreading around more than just a vaccine. My grandmother continually warns us about vaccinating our kids, stating that the way they vaccinate combinations of disease in a single shot is the cause of certain mental and physical illnesses. Her argument is convincing and it really worries me but vaccinating children to a certain level is required to put kids in school! 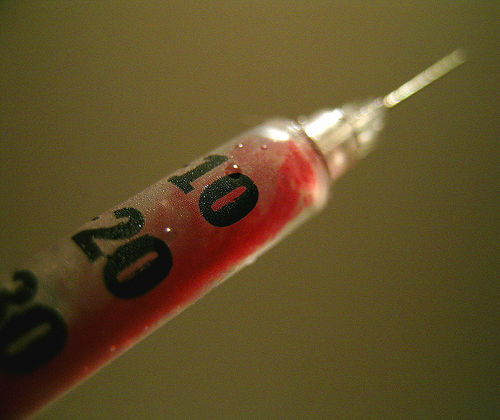 I’m needle-phobic, too — and like Ctreit, I make them lay me down whenever possible for blood draws. The sight of MY blood coming out of me makes me woozy and pass out. All psychological, but I can’t help it. If I don’t get the flu shot every year, I wind up with the flu at least once (and numerous times, TWICE) a year. Which is terrible. So the good that comes from the shot (not getting sick) is worth the psychological damage, lol. Crazy how seeing things can have that kind of affect on you physically. I don't like needles, either. Jesse, I agree with your question of once they stick you….how do they know the shot is going to the right place?….just doesn’t make sense to me. I’d rather drink something :). And as for the flu shot, i’ve always wondered…..aren’t there like a million different strains of the flu out there? So if you get a shot, even if it contains a few strains….seems to me like you can still pretty easily get the flu. It’s all a little fishy isn’t it….my daughter is doing fine now and I didn’t catch anything yet so let’s see if I can hold out for the rest of the year! Vitamin C here I come! I’m a believer in the “let germs come to you and build up your immune system” theory. I don’t take any special precautions to be clean. I don’t even wash my hands after #1 (it’s not dirty down there, trust me). I get a flu shot because it’s just injecting germs into my body, which I think is great for me. I’m sure some people think it’s gross, but it works for me. I’m basically never sick. My daughter got RSV which put us in the hospital for 3 days. To us it’s just a head cold or solitary sneeze but to her, it was very serious. The reason we have whooping cough on the rise in California is because of people who don’t vaccinate their kids. How can anyone question vaccinations when the statistics prove their value. Before we had vaccinations, the complications and deaths from the various diseases were not uncommon. I understand the needle phobia but don’t share it. In the Navy part of my job was knowing how to give shots and take blood. Are Naval bases open to the public, because I highly doubt these nurses volunteering at my office have been trained all that well..I think something in my past that has greatly contributed to my phobia is my dad’s experience with getting his blood drawn. He was stuck 12 times in one sitting once because the nurse…I actually don’t know what she was trying to do..but he always came back home with softball sized bruises. If I was confident in my nurse and trusted her to do a good job, things might be different. Thanks for the insider info Kay Lynn! Kay Lynn @ Bucksome Boomer on Is Auto Assure a Scam? Kay Lynn @ Bucksome Boomer on Amazon Prime Review – Is It For You?